Tasers vs Stun Guns: What's the Difference? Tasers vs Stun Guns: What’s the Difference? We use the words Taser and stun gun interchangeably, but do we really know what they mean? Tasers and stun guns differ in various things, the biggest being range. While a Taser can be shot from a distance, a stun gun requires direct contact with the attacker. Both deliver a powerful shock to the attacker and are meant to give you time to create some distance between the two of you. In this article, we’ll teach you more about the basics of Tasers and stun gun including other differences, the history behind them and more. Also we have reviewed and ranked the best tasers and stun guns for women and men, feel free to check it out as well. Although we may use the terms Taser and stun gun interchangeably, they are not the same thing. A Taser shoots probes at your target, typically within a range of 15 to 30 feet. A stun gun has prongs that must make direct contact with your target. A Taser is shot from a distance and is a form of electroshock weapon. A Taser shoots probes, which are connected to wires, toward your target. The probes, which are spear-shaped, penetrate clothing and sometimes skin, and emit an electrical current that can affect up to a two-inch area. Your target completes the circuit to deliver the electric shock. To give even more clarification about the Taser vs. stun gun dilemma, in the United States, we generally refer to face tissue as Kleenex. However, Kleenex is a brand of face tissue and is not the actual name of the product. The same goes for calling all gelatin dessert Jell-O. Jell-O is a specific brand of gelatin dessert and is not the name of all gelatin desserts. Taser is the name of a specific brand of electroshock weapon but does not classify all stun guns. A stun gun has two or more prongs attached to it to deliver the electric shock. To use a stun gun you must be in direct contact with the person since it does not shoot out any type of probe. Typically, two of the prongs will have an electricity arc between them that you can physically see; the other prongs have the same voltage as these prongs but it won’t be visible. It can be dangerous to use a stun gun because the person who is trying to harm you may reach you before you can use the weapon. However, a stun gun may be more comfortable to use and more accessible than a Taser. The Taser was invented by Jack Cover, an aerospace scientist affiliated with NASA’s Apollo moon landing. He came up with the idea in the 1960s as a solution for emergencies he saw in the news, like airplane hijackings. Taser is not a name but actually an acronym for Thomas Swift Electric Rifle or T.S.E.R. The name was chosen as a tribute to Cover’s inspiration, the science fiction novel Tom Swift and His Electric Rifle. An A was later added to make answering the phones easier—instead of saying T.S.E.R. they could say TASER. Tasers are not meant to kill people and do not emit a high enough voltage for lethal electrocution. However, there are circumstances where a Taser can result in death. Typically this occurs if someone has a heart condition. This is very rare though. Where Are Tasers Legal for Civilians? According to FindLaw, consumers are not allowed to possess Tasers in Hawaii, New York, New Jersey, Massachusetts, and Rhode Island. Other states may allow possession but may hold other limitations, like in Connecticut you can possess a Taser but can’t carry it in your car or on your person. Tasers are legal for civilians to own in most states, but make sure to check your state’s laws and check to see if you need a permit as well. Where Are Stun Guns Legal for Civilians? It is illegal for you to own or possess a stun gun in Hawaii, Massachusetts, New Jersey, New York, Rhode Island, Michigan, and DC. You can own a stun gun in Illinois but there are restrictions. The following cities do not all you to own or possess a stun gun either: Annapolis, MD, Baltimore, MD, Chicago, IL, and Philadelpia, PA. In addition the following counties are illegal: Baltimore County, MD and Crawford County, IA. What’s the Difference Between Police Tasers and Civilian Tasers? Tasers are frequently used by the military and police officers as a nonlethal form of defence. They are more expensive than the generic stun gun requiring replacement cartridges. Since police are trained to handle dangerous people, police-grade Tasers typically emit voltage for five seconds. This gives them time to get the suspect under control. Civilian tasers emit voltage for 30 seconds, which gives you time to get yourself away from the person. Generally, a police Taser can be shot up to 30 feet away from the suspect, whereas a civilian Taser can be shot up to 15 feet from the person. Police-grade Tasers can also have more probes, be more powerful, and have a quicker speed in regard to the probes firing. What Happens When You Get Tasered? The electricity overrides your brain’s control of your body by emitting pulses that match neuron pulses. Neurons transfer electrical pulses, or information, between the muscles and brain. When nerves are flooded with information, as they are during a Taser shock, neurons get covered up and muscles contract uncontrollably. The body often collapses to the ground and stiffens up some while shaking. Here’s a video of a person being Tasered in slow motion so you can see exactly what happens. Warning: this video may make you a little squeamish if you don’t like seeing probes entering skin. 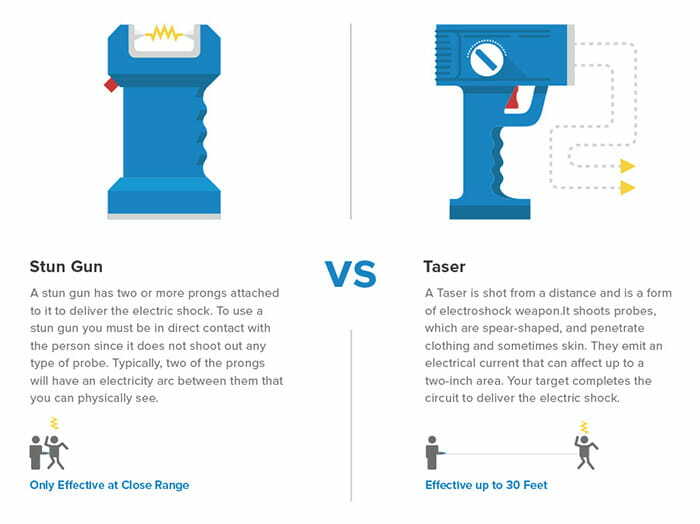 Should You Get A Taser or a Stun Gun? You want our opinion? We think Tasers are more effective and a safer option in comparison to stun guns. You don’t have to come in direct contact with your attacker and you can discharge the Taser and flee for safety immediately. Similar to a lethal gun, you’ll want to make sure you learn how to properly use this device. Although Tasers are not lethal, they are still intimidating to handle. So if you choose to get one, make sure you familiarize yourself with your Taser and consider taking a class to learn more about how to use it. The last thing we want is you in a dangerous situation and turning to use your Taser but finding out you’re unsure how to use it. Tasers and stun guns aren’t your only option for self defense. Be sure to check out our article What to Carry When You Don’t Want to Carry a Gun to familiarize yourself with your options. Remember, it’s important to plan ahead of time for these types of situations. You never know when you’ll find yourself in a dangerous situation like a person trying to steal your purse, wallet, or something else valuable to you. Or even worse, someone trying to kidnap or hurt your physically. Plan ahead of time and keep yourself protected. What questions do you have about Tasers and stun guns?